The compact car segment is huge right now, and the Hyundai Elantra and Toyota Corolla sedans are among the most popular, but which of the two is the better option? It’s no real surprise that compacts are dominating right now, as they are dynamic vehicles that are affordable and comparatively inexpensive to maintain. Not all models are created equal, though, so which should you buy and which should you avoid? The US version of the 2017 Hyundai Elantra got a new design that included a stylish and aerodynamic new body. It also comes equipped with a host of standard premium features as well as an interior that is more upscale than you would expect in a compact. Some of the cooler equipment includes is the likes of HID headlights, adaptive cruise control, and the ability to open the trunk, hands-free. The 2017 Elantra sedan also comes equipped with an 8-inch display screen that can be integrated with a smartphone using either Android Auto or Google CarPlay. The Elantra is powered by a 2.0-liter naturally aspirated engine that cranks out 147 horsepower. Hyundai’s 4-cylinder engine can be mated to wither a 6-speed manual or automatic transmission. The Corolla has long been at or near the top of the segment, and is a big seller for Toyota. The base engine under the hood is a 1.8-liter 4-cylinder that delivers 132-hp, and it can be mated to a 6-speed manual or automatic transmission. Move up to the Eco version of the Corolla and you will see an uptick in power and fuel efficiency. The 42 mpg that this one gets is really quite impressive. Both the Elantra and Corolla start at about $18,000, although the Elantra is about $200 less. 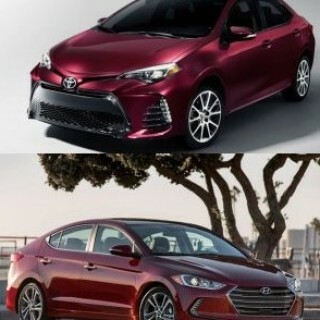 Which of the two do you think is the better buy, the Hyundai Elantra or Toyota Corolla?